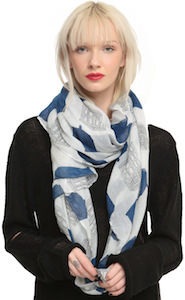 Girls love their scarfs and if you are a fan of Doctor Who then you may like this Tardis scarf. The Scarf has a white background and printed on that you can find the Tardis all over in two versions a “normal” blue one and one that is just a line drawing. Together both pictures makes this into a great looking design. And this Doctor Who scarf is just easy to combine with so many items in your wardrobe that you probably will be wearing this scarf very often. Why would any fan of the Doctor go with a scarf that isn’t Doctor Who when you can have your own Doctor Who Tardis All Over Scarf.